John Singer Sargent (1856–1925), La Carmencita (c 1905), other details not known. Wikimedia Commons. Spanish dancers make excellent subjects for paintings, especially if they’re enjoying success at the time. Carmen Dauset Moreno (1868-1910), popularly known as Carmencita or La Carmencita, was perfect for that role. 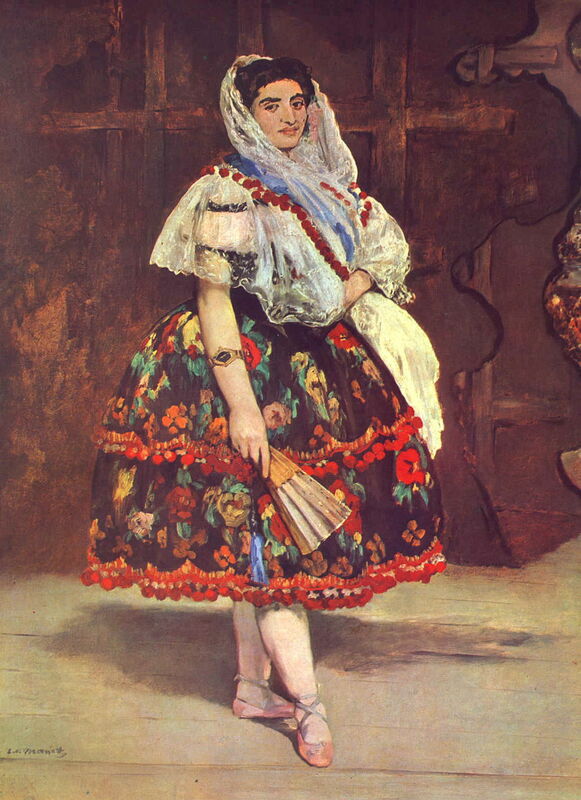 Born in Almería, Spain, she learned to dance in Malaga, dancing professionally there in the Cervantes Theatre in 1880. In a couple of years she was touring Spain, then went on to dance in Paris and Portugal. Her performance in the Exposition Universelle in Paris in 1889 impressed a theatrical agent, who invited her to visit the US – under his management, of course. She first appeared on stage at Niblo’s Garden in New York on 17 August 1889, and the following year changed managers and moved to the 23rd Street Concert Hall. In 1895 she returned to Europe, touring in London and Paris, before dying at the age of only 42. Both John Singer Sargent and William Merritt Chase set off in pursuit of her, in the hope of painting her in 1890. Sargent was commissioned to paint her by his patron Isabella Stewart Gardner, and was already working on studies in preparation when he came across Chase, who was looking for the right opportunity. At this time, Chase had his Tenth Street studio, in which he had already been arranging theatrical spectacles for his patrons. Sargent wrote to Chase, suggesting that the studio would be an ideal venue for her to appear, allowing both artists to paint her there. Sargent – and probably Chase as well – was already aware of Manet’s oil painting of Lola de Valence (1862), and perhaps his preparatory watercolour. Although now one of Manet’s less well-known paintings, it was celebrated at the time for conforming more to artistic norms, and had been accompanied by verse written by Baudelaire. John Singer Sargent (1856–1925), Spanish Dancer (1880-81), other details not known. Wikimedia Commons. 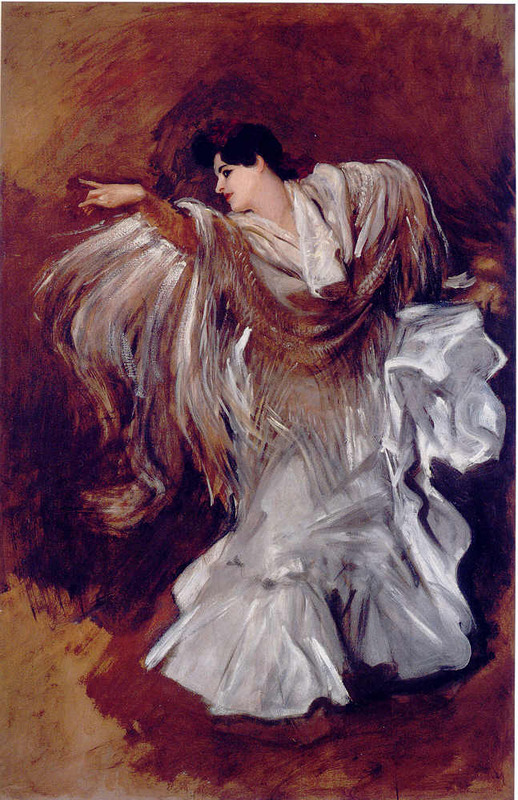 Sargent already had a track record of painting his Spanish Dancer (1880-81). 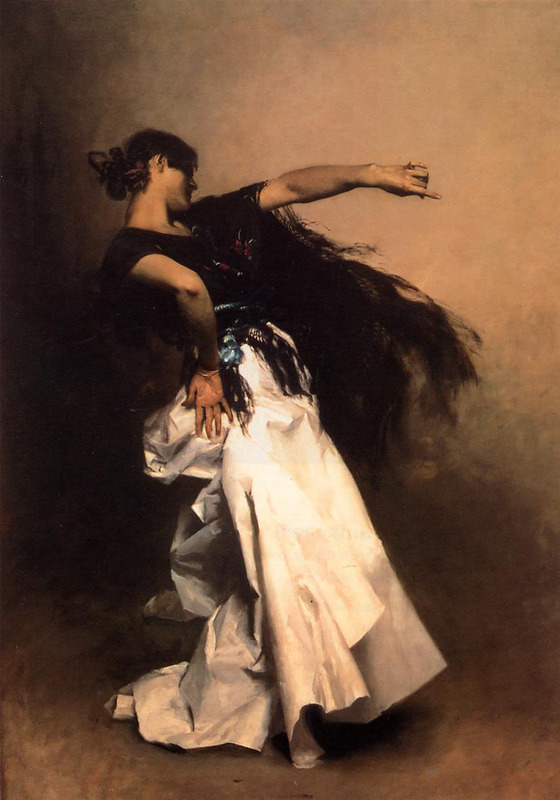 On the evening of 1 April 1890, Sargent, Chase, and Carmencita met in Chase’s Tenth Street studio; she danced for them, and they sketched. John Singer Sargent (1856–1925), La Carmencita (1890), oil on canvas, 232 x 142 cm, Musée d’Orsay, Paris. Wikimedia Commons. On this occasion, Sargent opted for a more static pose, similar to that of Manet’s painting, in his La Carmencita (1890), with her hands at her hips, driving her bust out and her chin high, in assertive pride. Chase shows her in the midst of her dance, dynamic, vivacious, and happy. Her fingers play castanets, and her sash is thrown away from her body with her movement. There are two other significant portraits of Carmencita, painted rather later. 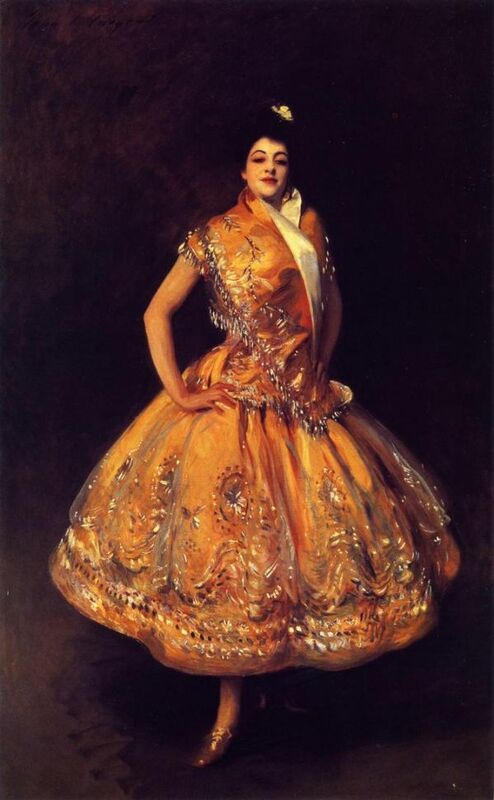 Fifteen years later, a decade after her dancing career went into decline, Sargent produced a completely different portrait, one of his best, in my opinion. Now his virtuoso brushstrokes capture her motion. His inspiration was no longer Manet, but Giovanni Boldini. A mutual friend of Sargent and Chase was (James) Carroll Beckwith (1852-1917), who had been a pupil of Carolus Duran alongside Sargent in 1877. Although Beckwith missed the performance in Chase’s studio on 1 April 1890, he caught up with her when he was in Paris, probably, in 1907. James Carroll Beckwith (1852–1917), Carmencita (1907), oil on canvas, 81.3 x 64.8 cm, Private collection. The Athenaeum. 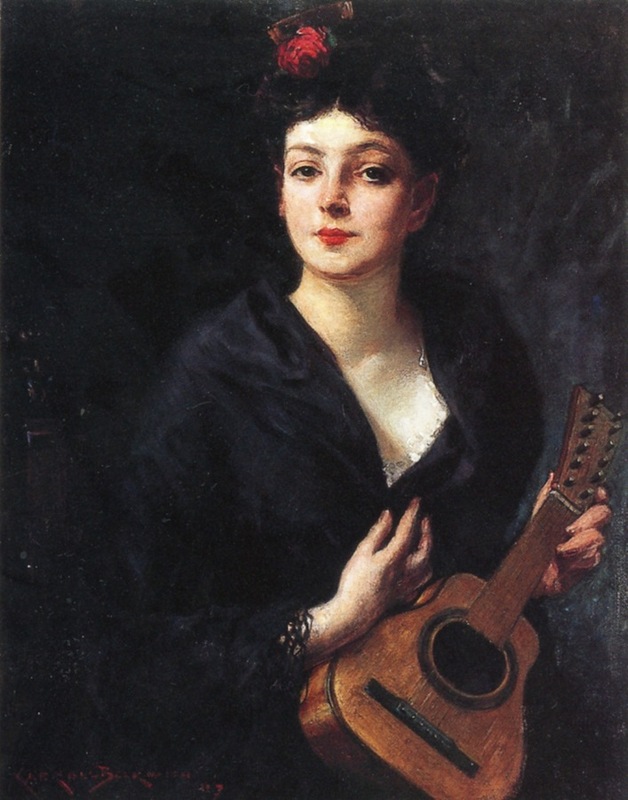 Beckwith’s Carmencita (1907) shows an older woman, no longer dancing, but holding a guitar. The swirl and flash of her youth have faded, and in three years she was dead. Chase, Sargent, and Beckwith were contemporaries and good friends. Both Sargent and Beckwith painted Chase’s portrait, which perhaps reveal insights into Chase’s personality that we might otherwise miss. Beckwith painted Chase in 1881-82, when Chase was in his early thirties. His patent leather shoes appear quite incongruous, and his left hand looks much older than his face. 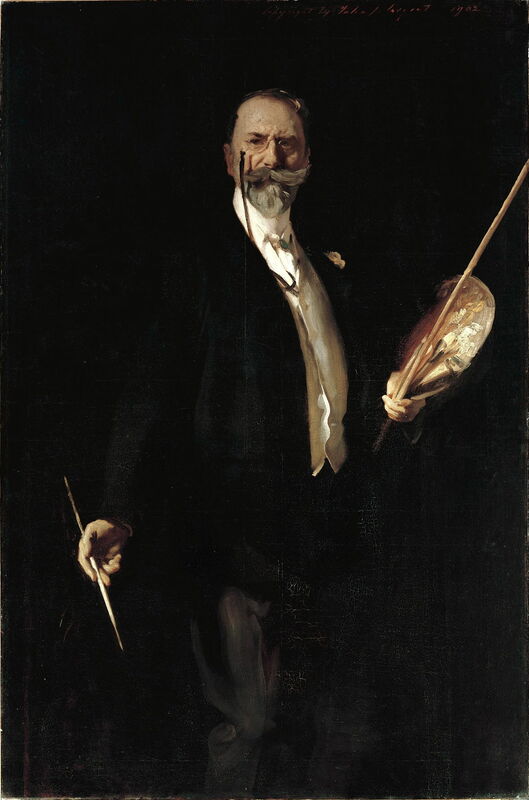 Sargent shows Chase in his fifties, immaculately dressed, with a carnation in his button-hole, and the tools of his art in hand. With the centenary of Chase’s death drawing close, they are fascinating images to bear in mind. Posted in General, Painting and tagged Beckwith, Carmencita, Chase, dancer, Manet, painting, portrait, Sargent. Bookmark the permalink. 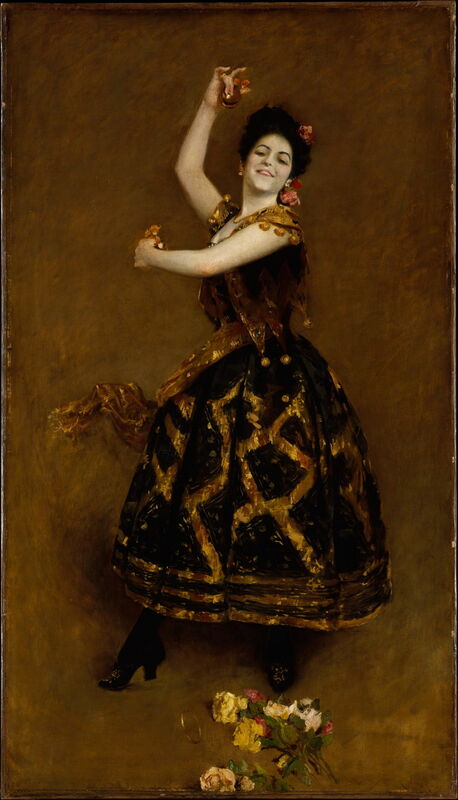 It is generally accepted that the only painting of Carmencita which Sargent painted in 1890 is the rather staid version shown, now in the Musée d’Orsay. The more vibrant painting is attributed to 1905 in Wikimedia Commons, but I have not checked it in his Catalog Raisonné. It must be significantly later than 1890, as it was the 1890 version which went on tour and was bought for the French nation in 1892: I cannot imagine that happening if the later painting had been on offer at the same time. The later Sargent does not come from Smithgall, although there is an excellent section on the Chase-Sargent collaboration in that book. I strongly recommend it for anyone interested in Chase. In the literature I have studied it doesn’t show the date of 1905 anywhere. Wikimedia Commons cites art.net as its reference, but the link leads to a painting by Boldini that actually is dated 1905. So maybe they made a mistake there. The only date I have come across is 1890, although nobody explains how it has been dated. 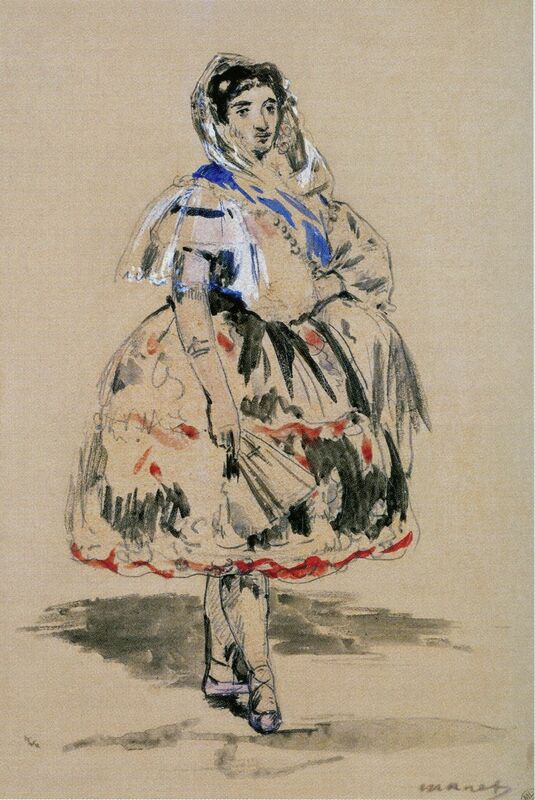 It is said to be a study/sketch connected with Sargents painting ‘El Jaleo’ from 1882, because the dancer has almost the same pose in mirror image and the same dress with mantón. Maybe it wasn’t for sale or on exhibition because it was (merely) a sketch. But I’ll check the catalogue raisonnee as well. Keep me posted if you find any new information! Done. My email address is given in the About page for you or anyone to use as they wish.